Where we live now, on the high plateau just to the west of Colorado’s Rocky Mountains, autumn sometimes extends all the way to Christmas, or at least that’s how it feels. Sure, it gets cold at night and the leaves are off the trees, but the days are sunny, warm and dry. What’s missing from our early winters here is the snow. Our card photo, taken on December 10, would have looked pretty much the same, except for the jackets, if it had been taken back in September. 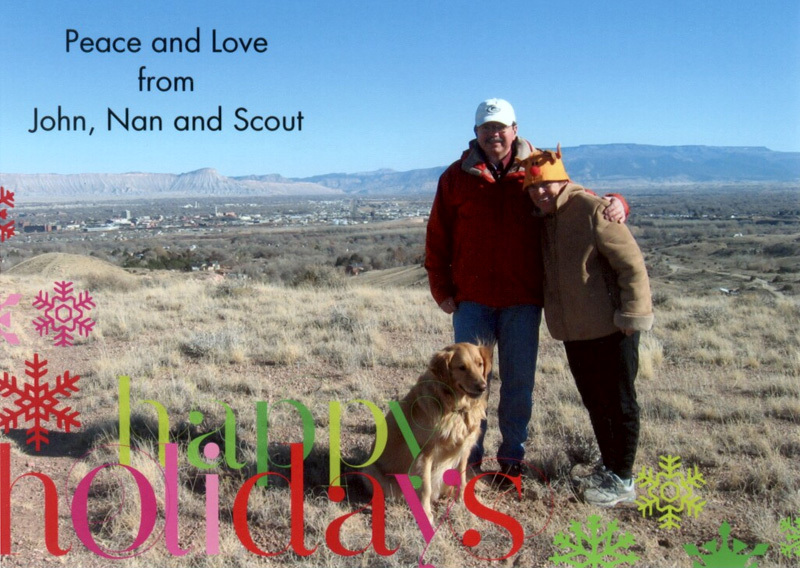 It shows the three of us standing at the top of a hill in the Tabeguache area, about a mile from our home. In the background are downtown Grand Junction, Mt. Garfield, Chalk Mountain and the Grand Mesa—but no snow! Nan and I are fully settled in Grand Junction now, both living and working. I started a new job in January as a programmer analyst with Quality Health Network, and Nan started in the spring as a pharmacy technician at St. Mary’s Hospital. It’s good to know that in our recessed economy, there is always demand in healthcare. Scout has settled into a new routine of his own, spending Tuesdays and Thursdays at doggie daycare, where he romps all day with his dog buddies. With the new jobs, we didn’t get to travel as much this year. We spent a quick week at the end of April in what is becoming our home away from home, Isla Mujeres, Mexico, where we hung out with our local friends, tried new restaurants, and read novels on the beach. We also checked out the accommodations at the local marinas, with the idea of sailing Whispering Jesse down there in a couple of years. The refit project on our sailboat took several months longer than expected. I flew out to Solomons, Maryland to check on it in May, and then Nan and I both flew out there in July for Nan’s first-ever look at the boat. 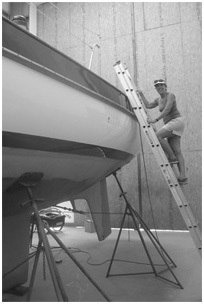 The photo above shows her climbing a ladder to the boat while it was out of the water. By September the boat was almost ready to go. Two friends from Aspen, Mike and Kurt, flew out with me to help make final preparations to move the boat to Savannah, Georgia. 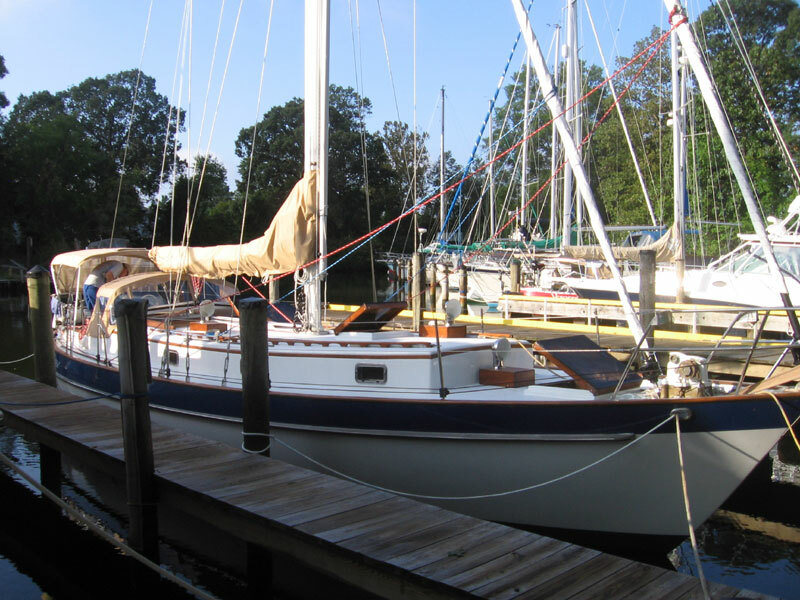 We departed a week later, three days later than planned, sailing overnight on Chesapeake Bay to Norfolk, Virginia. Then it was three days of motoring through the Intracoastal Waterway, emerging into the Atlantic Ocean at Morehead City, North Carolina. We sailed continuously to make up lost time, but we were overrun by a terrible storm on the second morning and pulled up short in Charleston, North Carolina. Mike and I flew out a month later to finish the move, sailing overnight to Savannah, where Whispering Jesse is now slipped at a marina near my folks’ vacation home on Skidaway Island. Plans are now in the works for a Lichty family rendez-vous there next spring, featuring day sails and bad golf. Nan made a few trips home to Manitowoc, Wisconsin during the year to visit family and friends, most recently in October, when she attended the wedding of her niece. Congratulations to Laura and Chris! The next day, she and her friend Gail ventured to Lambeau Field to watch the Packers add to their undefeated streak with a victory over the Denver Broncos. Until a few days ago, we were reconciled to a brown Christmas. But then there was an overnight dusting. And last night there were a few fresh inches. Now it seems we’re on course for a real white Christmas, our annual wish come true. Here’s hoping all your wishes come true this holiday season and in the coming year. With Whispering Jesse safely slipped at the Delegal Creek Marina in Savannah, my thoughts have turned to boat improvement projects. The list is long, but one of the simpler projects would be to add midship cleats for securing spring lines. Unlike most modern sailboats, which feature a toe rail mounted around the perimeter of the deck, our 1980 Valiant 40 features a full cap rail. It essentially lowers the deck about six inches below the top level of the hullsides, offering protection from slips as well as a place to stand on the leeward beam when the boat is heeling. There are hawseholes at the bow and stern to accommodate bow and stern cleats for securing dock lines, but there are no hawseholes at the beam, obviously, because the beam is frequently underwater while the boat is underway. Thus, there are no cleats amidship, and spring lines must be rigged from the bow or stern, as shown in the photo above. This is inconvenient for a couple of reasons. In some docking situations, the spring lines end up being excessively long, reducing their effectiveness at holding the boat in place. And because of their position, the spring lines tend to rub against the hull and cause minor damage, especially when they are occasionally dipping into the water, picking up sediment and sea life. Before Mike and I moved Whispering Jesse to an adjacent slip at Delegal Creek Marina the morning after our arrival there, the overnight rubbing of a spring line caused some damage to the boat's adhesive name letters on the port side near the stern. So adding a pair of midship cleats might not be a bad idea. Searching the Internet, I found that New Found Metals (http://www.newfoundmetals.com/), the manufacturer of our boat's spiffy new stainless steel portlights, also makes ten-inch stainless steel cleats that look just like our boat's stock ones. I'm thinking they could be attached directly to the cap rails, but I will get advice from a boatyard first. It might be more prudent to mount them to the deck, near the closely-spaced chainplates on either beam, and then also attach chocks on the cap rail to limit chafing. It's looking like Nan and I will be headed out to Savannah in early April, along with assorted family members, to work on the boat and do some sailing to nearby destinations, perhaps Tybee Island or Hilton Head Island. I will keep you posted on plans for the trip, as well as on other future boat projects. A few weeks ago, Nan and I were in Moab for a race she wanted to run. It was a cold, wet and miserable Saturday morning, but she seemed upbeat and excited when Scout and I dropped her off in the muddy campground parking lot off Kane Creek Road. I told her we would pick her up in a couple of hours and then backtracked up the road to the parking lot at the trailhead of the Moab Rim Trail. It's the trail that connects with the Hidden Valley Trail, which I have hiked several times as an "out and back," first with Charlie and then with Scout. There is a chapter in my book, Raising Charlie, that details Charlie's and my last hike together on the Hidden Valley Trail, just weeks before he died. As Scout and I hiked through the drizzle up the steeply sloping slickrock, I thought about what it would take to hike the entire distance of Hidden Valley and Moab Rim. It would be six to seven miles one way, so having a car or an arranged ride at each end would be necessary. 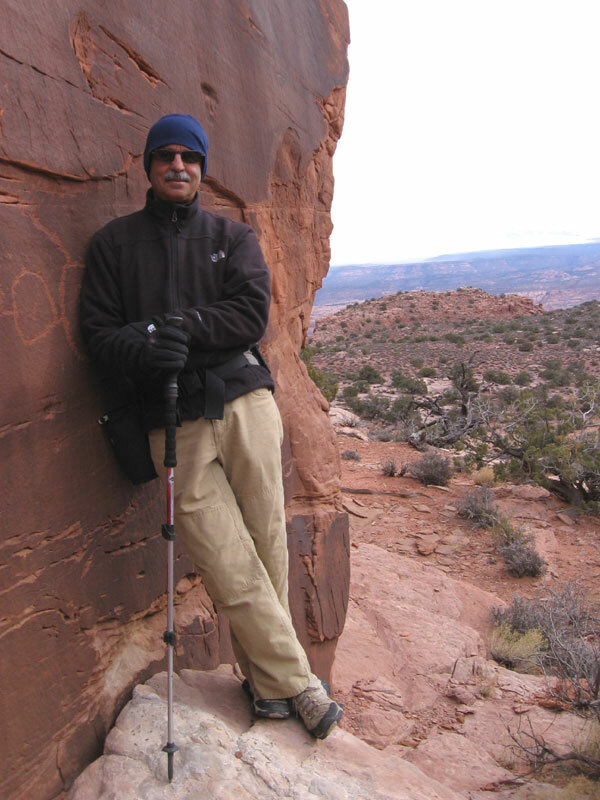 When Scout and I reached the top of the Rim, where the trail overlooks the city of Moab, I tried to gauge the distance and direction to the Hidden Valley trailhead, far out of sight around the Rim to the south, off Highway 191. Looking out ahead to where the trail would lead us if we had more time, I saw that it disappeared quickly among a series of loaf-shaped sandstone bluffs. Someday, I thought. Well, someday came quickly. 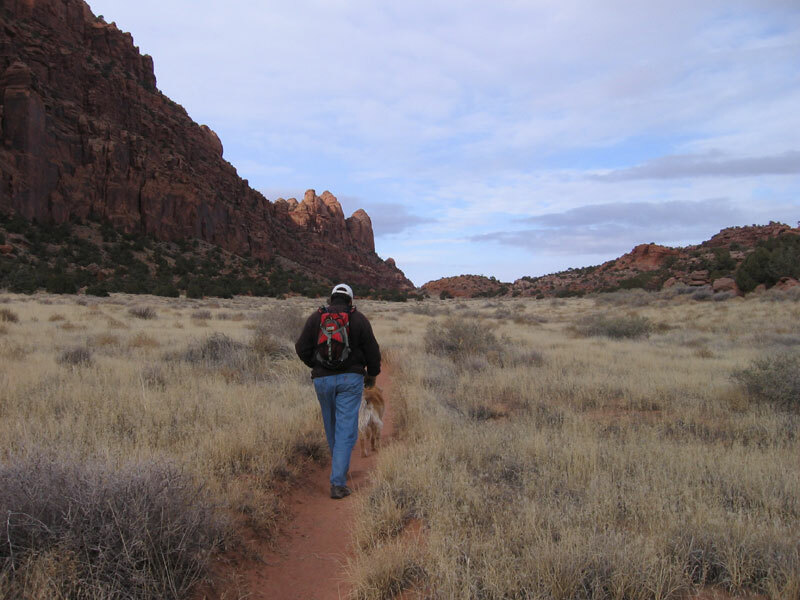 Last Saturday, Scout and I, along with my friend John Sasso, did the entire Hidden Valley to Moab Rim hike. Nan and John's wife D were running the annual Moab Winter Sun 10K, and we drove down separately, so we had the two cars we needed. I had asked John earlier in the week if he would be interested, knowing that he's always up for a hike, and then it was just a matter of working out the logistics. We dropped the wives off at the race and left John and D's car at the finish area, then drove down Highway 191 to the Hidden Valley trailhead, off Angel Rock Road. It felt good to be hiking the trail again. It had been since the same weekend last year while Nan was running the same race that Scout and I had hiked it. There had been snow that day, but only wind and cold on this day. It had been months since John and I had talked, so we used our hiking time together to catch up. Before I knew it, we were at the top of the initial steep, rocky section of the trail and standing in front of the juniper tree where Charlie and I had stopped for a drink on our last hike. It made me feel melancholy to picture him again sitting under the tree and smiling at me. I gave Scout a drink from my CamelBak and we continued up the trail and into the first of two giant sagebrush meadows. Before long, we reached the side trail to the wall of petroglyphs, where I took the cover photo for Raising Charlie. John was impressed by the figure of a single man etched into the rock and asked me how old I thought it was. 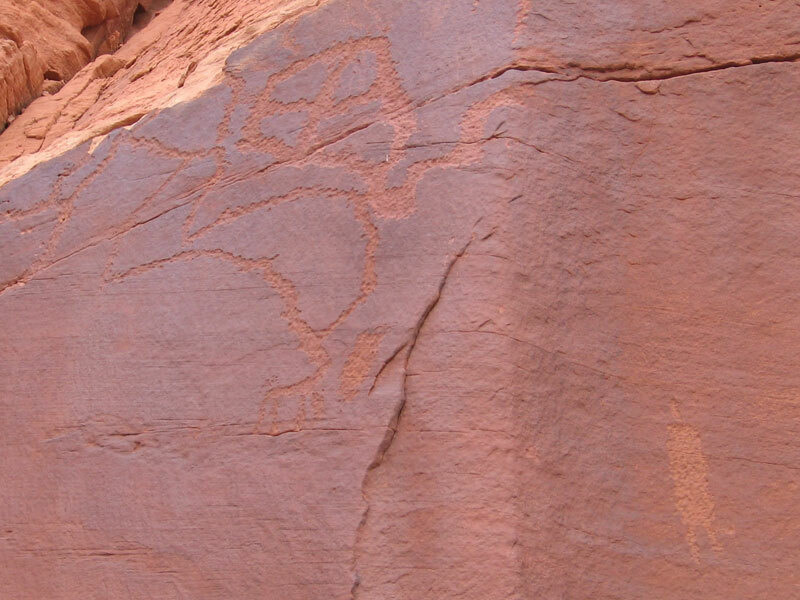 I guessed, at least a thousand years, knowing that the Anasazi who lived in this area had moved on more than eight hundred years ago when the climate became too arid. 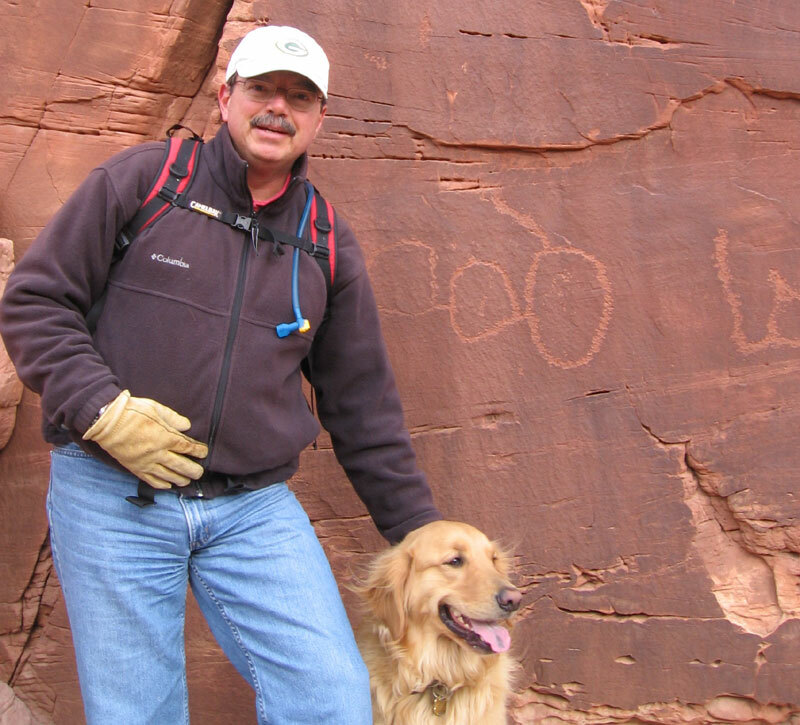 I asked John to take a photo of Scout and me in front of the "map" petroglyph, which I believe is a representation of the access trail and two meadows that lead up to the wall from the valley floor below. Then I took one of John, with the valley and the La Sal Mountains in the background. I stopped and turned around as we were leaving the wall, again picturing Charlie as he had been that day. I will always associate him with this special place. We backtracked to the main trail and then, instead of heading back down the way we had come, as I had done so many times before, we continued up and over a low pass to the Moab Rim Trail for the very first time. At this point, I was no longer on familiar terrain and needed to pay close attention to the trail, even though it quickly turned into a double-track, because it wound crazily over and around extensive slickrock sections. Off in the distance, we saw three jeeps negotiating difficult spur trails, but they were the only other human activity we had seen to that point. We had been hiking for more than two hours when the trail seemed to loop back upon itself and head in an uphill direction, contrary to what I was expecting. But then we came around a curve and I spotted the trail sign that Scout and I had marked as our turnaround point on the Moab Rim hike a few weeks before. The three of us paused to admire the view of Moab from the overlook and then headed down the steep slickrock toward the trailhead. I was looking ahead to see if Nan and D might be waiting for us down there, but I didn't see them. John had only one bar on his Verizon cell phone when we reached the parking lot, but he was able to call Nan and D and ask them to pick us up. John, Scout and I walked up Kane Creek Road a ways to meet them, piled into John and D's car, drove around to pick up our car at the Hidden Valley trailhead, and then drove back to the Moab Brewery for a well-deserved lunch before heading back home.